We have hand-picked a selection of best selling Everki bags. Learn more and compare prices. The Lunar briefcase is a sleek and convenient companion that's great for everyday carrying to and from the office or on short business trips. 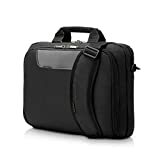 It features a laptop compartment that can hold up to a 15.6" laptop, a stylish accessories compartment, and a quick-access pocket on both the front and back. The dedicated laptop compartment is both felt-lined and well-padded to provide the utmost protection for your laptop from bumps and scratches. The zippered accessories compartment folds out slightly when opened to provide a touch of style as well as easy access to the many inner pockets. Within this accessories compartment you will find separate zippered pockets as well as other pockets of various sizes to help you neatly organize your power adapter, cables, business cards, pens, etc. In the front of this compartment, there is a quick-access pocket with a magnetic closure that is ideal for carrying airline tickets and various other knick knacks. Please watch the video below for a better idea of the storage space available. On the back of the Lunar, you will find a large pocket that's suited for carrying business folders, magazines, paperwork, etc. And outside of that is a smaller quick-access pocket that can be used as additional storage space, or it can easily convert into a trolley pass-through strap for convenience on the go. Making for a comfortable carry, the Lunar is equipped with a non-slip shoulder strap that evenly distributes the weight by intuitively contouring to your shoulder; fine adjustments to the strap length can be made manually. Not only is the Lunar light and practical, but it also boasts a ton of quality accents and features that give it its stylish appeal - water-repellent nylon body, leather accents, high-grade nylon straps, oversize zippers, and a reflective metal logo to name a few. 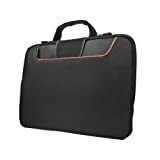 If you are looking for a laptop briefcase that is practical and stylish, look no further. Not just your average sleeve. The Commute provides extra protection for laptops up to 15.4" while carrying inside a bag or independently with its clever stow-away handles. Elastic corner guards keep zippers away from your laptop and also maintain the most effective positioning for the Commute's advanced memory foam padding to absorb bumps and shocks. Soft felt interior lining will not scratch. A front stash slot can accommodate a power adapter and small accessories, making the Commute a capable independent hand-carry shuttle. The handles cleverly stow away when carrying inside another bag. As with all Everki products, the Commute is backed by Everki's Limited Lifetime Warranty and world-class customer service. The Advance is one netbook case that is more than just a sleeve. Providing ample storage in a compact design, the Advance netbook case expertly carries up to a 10.2" netbook and accessories. Grab the hand-carry handles or sling it over your shoulder with the full-sized shoulder strap and go. Dual-sided adjustable straps ensure that your shoulder pad stays centered on your shoulder for maximum comfort. The Advance's separate zippered accessory compartment stays organized with a generous assortment of multifunction pockets while a quick-access front stash slot keeps important items close at hand. As with all Everki products, the Advance is backed by Everki's Limited Lifetime Warranty and world-class customer service. Make the Advance laptop briefcase your everyday bag. Its slim profile, contemporary design, and lightweight construction make the bag an effortless carry. The spacious, well-padded, top-loading compartment allows quick and easy access to laptops up to 16". An included removable non-slip shoulder strap comfortably distributes weight by intuitively contouring to your shoulder; fine adjustments to the strap length can be made manually. The Advance's separate zippered accessory compartment stays organized with a generous assortment of multifunction pockets while a quick-access front stash slot keeps important items close at hand. As with all Everki products, the Advance is backed by Everki's Limited Lifetime Warranty and world-class customer service. Not just your average sleeve. The Commute provides extra protection for laptops up to 13.3" while carrying inside a bag or independently with its clever stow-away handles. Elastic corner guards keep zippers away from your laptop and also maintain the most effective positioning for the Commute's advanced memory foam padding to absorb bumps and shocks. Soft felt interior lining will not scratch. A front stash slot can accommodate a power adapter and small accessories, making the Commute a capable independent hand-carry shuttle. The handles cleverly stow away when carrying inside another bag. Not just your average sleeve. The Commute provides extra protection for laptops up to 13.3" while carrying inside a bag or independently with its clever stow-away handles. Elastic corner guards keep zippers away from your laptop and also maintain the most effective positioning for the Commute's advanced memory foam padding to absorb bumps and shocks. Soft felt interior lining will not scratch. A front stash slot can accommodate a power adapter and small accessories, making the Commute a capable independent hand-carry shuttle. The handles cleverly stow away when carrying inside another bag. As with all Everki products, the Commute is backed by Everki's Limited Lifetime Warranty and world-class customer service. As with all Everki products, the Commute is backed by Everki's Limited Lifetime Warranty and world-class customer service. Make the Advance laptop briefcase your everyday bag. Its slim profile, contemporary design, and lightweight construction make this bag an effortless carryall even for large laptops. The spacious, well-padded, top-loading compartment allows quick and easy access to laptops up to 17.3”. A removable non-slip shoulder strap comfortably distributes weight by intuitively contouring to your shoulder; fine adjustments to the strap length can be made manually. The Advance’s separate zippered accessory compartment stays organized with a generous assortment of multifunction pockets while a quick-access front stash slot keeps important items close at hand. As with all Everki products, the Advance is backed by Everki’s Limited Lifetime Warranty and world-class customer service. Designed to be your hassle free companion, the Agile is our slimmest bag yet. With a separate laptop compartment and two quick access pockets front and back, this briefcase is the choice for those who prefer to grab-and-go. The front quick-access pocket is filled with a generous assortment of multifunction pockets, as well as a zippered accessory pocket, ideally suited for power adapters. The back quick-access pocket is designed to carry files and magazines, and is also equipped with a trolley strap for easy traveling. The non-slip shoulder strap comfortably distributes weight by intuitively contouring to your shoulder; fine adjustments to the strap length can be made manually. As with all Everki products, the Agile is backed by Everki's Limited Lifetime Warranty and world-class customer service. This spacious messenger is designed to become both your favorite laptop sling and your favorite general-use bag. 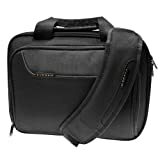 The Track comes with a number of thoughtful features including a heavily padded laptop compartment, an additional soft felt-lined compartment that is ideal for keeping your iPad, Kindle or other similar tablets safe and snug, and a large general purpose zippered compartment that serves well to carry your laptop power adapter. The back quick-access pocket can be turned into a trolley strap for easy portability while the unique carrying handle is neatly designed to blend in with the rest of the bag. Additional multipurpose pockets and pen holder can be found outside the main compartment, yet securely under the messenger flap. The non-slip shoulder strap comfortably distributes weight by intuitively contouring to your shoulder; fine adjustments to the strap length can be made manually. The front of the bag features two unique Everki buckles that not only adds a touch of style but secure the flap from being unknowingly opened. A reflective orange strip on the front flap adds extra protection at night. As with all Everki products, the Track is backed by Everki's Limited Lifetime Warranty and world-class customer service. The Glide is a light and compact backpack built for the modern commuter. This sleek and versatile new addition to Everki's line of high-quality bags for larger devices features a compartment designed to hold up to 17.3Ó laptops without sacrificing mobility. 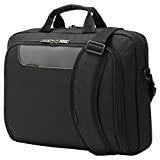 The compartment comes equipped with a padded, felt-lined laptop slot and a separate slot for an iPad/Kindle/tablet PC, both held firmly in place by a quick-release strap that minimizes shifting and wear-and-tear on the road. Everki also outfitted the Glide with its integrated laptop corner guard system - extra reinforcement built into the bag that protects laptops around the corners, where they are most likely to sustain damage. 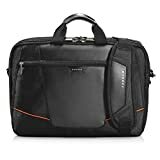 This bag's stylish design allows it to fit in anywhere, and its slim exterior conceals an interior made to accommodate all of the necessities of both today's professional and the casual traveler. A convenient key ring buckle and a range of functional slots and pockets - including an innovative stash pocket built into one of its wide straps - make room for small and medium-sized devices and accessories, pens, business cards, keys, and more. 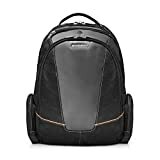 In addition, a large, zippered see-it-all pocket inside the laptop compartment and the Glide's attractive high-contrast interior lining make items easy to find. Comfort is no problem for the Glide's wearer. 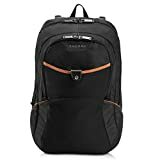 Its compact design minimizes bulk and its well-padded, easily-adjustable shoulder straps pitch in to help bear the load and make fine adjustments a breeze. Peace of mind is also part of the package, as like all of Everki's products, it is backed by the company's lifetime warranty protection. Features: Dedicated ultra-soft padded laptop compartment accommodates up to 16" laptopsLeather handles and accentsAnti-shock foam padding to guard against bumpsExtra-padded, ergonomic, non-slip shoulder padSeparate front accessory compartmentTwo-way adjustable shoulder strapTrolley handle pass-through strapLaptop Compartment: 15.55"x1.57"x11.42"
With the success of its Flight backpack, Everki saw fit to repackage this bag's quality, functionality and spirit in briefcase form. The Flight laptop briefcase is rugged enough for the road warrior yet sleek enough for the professional. What's more, its innovative felt-lined, Checkpoint Friendly 16Ó laptop compartment makes it perfect for travel. This compartment opens a full 180 degrees and allows the bag to pass quickly and easily through the airport x-ray scanner without having to remove the laptop, minimizing hassle and making boarding a breeze. The Flight's laptop compartment also features an iPad/Kindle/tablet pocket lined with the same soft felt as the computer slot, as well as a smaller pocket perfect for media players or other compact electronics. 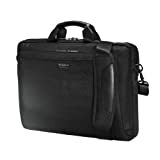 A second large compartment features a key ring buckle, a zippered see-through pocket, two large slots for cables, external devices, or travel accessories, and an array of slots for pens, business cards, and items. In addition, a third, smaller zippered compartment allows the user to keep passports or other travel documents close at hand to ensure a stress-free journey, wherever the destination. Comfort is no problem for the Flight's wearer, even with a full load. An ergonomic, two-way adjustable shoulder strap allows fine adjustments for maximum comfort and its wide, soft leather pad prevents slippage and pitches in to absorb some of the weight. Peace of mind is also part of the package, as like all of Everki's products, the Flight is backed by the company's lifetime warranty protection. Travel light with the Swift's sleek profile, streamlined compartments and solid construction. Busy students and corporate users alike will love the spacious interior that can accommodate up to a 17" laptop, power adapter, and accessories. The elastic Snug-Fit laptop compartment easily stows out of the way when not carrying a notebook, allowing the Swift to double as a multipurpose gym, school, or weekend bag. A variety of multifunction accessory pockets keep the main compartment clean and organized. 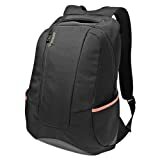 Exterior features include a zippered outer pocket for quick access to essential items, side pockets for water bottles or other small items, padded shoulder straps with integrated headphone cable management, and a reinforced hand-carry grip. As with all Everki products, the Swift is backed by Everki's Limited Lifetime Warranty and world-class customer service. The Urbanite is designed to carry a surprising amount of gear without becoming too bulky or overbearing. 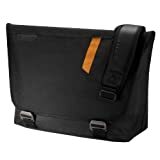 This fashionable vertical messenger works great as a laptop sling or as your favorite general-use bag. Its construction includes durable, high-quality nylon, stylish leather and metal accents, and tons of useful compartments and other unique features that set the Urbanite apart from the crowd. 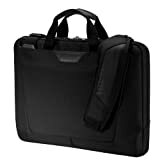 This bag easily stores laptops up to 14.1" in a dedicated compartment that opens a full 180 degrees for easy loading. This feature also eases travel by allowing you to pass through airport security checkpoints without having to remove your device from its compartment. The Urbanite fits your laptop snugly inside a separate well-padded and felt-lined slot that protects it from bumps and scratches to give you piece of mind while on-the-go. The Urbanite's main storage compartment features a felt-lined pocket ideal for your iPad, Kindle, or other Tablet PC with lots of space left over to store and arrange as you please. You'll be pleasantly surprised by just how much this slim, sleek bag can accommodate. Yet a third compartment offers even more space inside of open, zippered, and see-it-all pockets, and a slim pocket placed under the cover flap allows quick and easy access to folders, travel documents, or reading materials. As if these compartments left you wanting for space, two side pockets, secured with Velcro strips, offer convenient places to stash smaller items like cell phones, keys, or even water bottles where they are easy to reach. 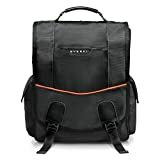 Everki rounds out all of these features with a broad cover flap that completely covers all of the bag's compartments and secures snugly using a Velcro strip and quick-release buckles. 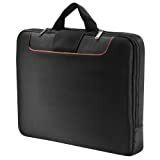 The flap also contains a zippered pocket suitable for business cards, ID, portable media players, or anything else you need to quickly store and retrieve during business transactions or casual outings.